Please note: All crawfish services are dependent on the season and availability. 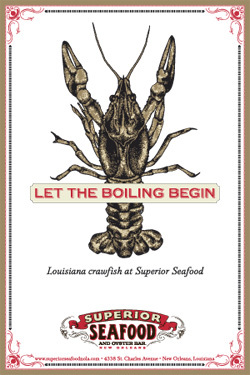 In addition to serving dine-in and take-out boiled crawfish (when in season), Superior Seafood is proud to offer its services for your on-site boil or if you’d just like your boiled crawfish delivered hot and ready to serve. We’re equipped to provide you with everything you’ll need at the venue of your choice to make your crawfish boil an unforgettable experience. We can handle many of the elements needed to make your event stress-free: uniformed servers, an oyster bar with oyster shucker(s), cups, ice, and assorted beverages, or a full bar with bartender(s). Additionally, we can arrange for any setup needs and supplies, such as tents, tables, chairs, linens and much more. Superior Seafood’s boil catering menu (at the most basic level) includes boiled crawfish and/or shrimp with boiled potatoes and corn. All specific pricing is available upon request and is dependent on current market prices. We do have an on-site boil minimum of $750, with the availability for smaller parties to pick up or have us deliver crawfish for a small service charge. On-site boils are subject to 18% gratuity and the option of trash pickup and haul away for $100. We’d love to assist with your next event and would be happy to assess your needs and customize a proposal accordingly. Please contact the restaurant for additional information.